Fatwa Fadillah stoops among the make-shift tarp tents, urgently seeking information, but also needing to patiently listen and assess. Almost a week has passed since an earthquake struck his homeland. It toppled buildings and crumbled roads. Hours later, a tsunami washed away people, property, roads and crops. As each day passed and the death toll rose, searchers feared more people trapped in rubble would not be reached in time. Days after the quake and killer wave, another shock: a volcano erupted not far from the epicentre of the quake, further complicating the crisis. Now, as many as 1.5 million people are desperately waiting for help. Fatwa works for Catholic Relief Services, an American Caritas member organisation, as a disaster risk reduction manager. He was among the first to arrive in Palu. His role today is to get the right aid to some of the most vulnerable affected. “In Jonohoge village, I had to interview many people very fast to understand how much and what kind of aid is needed,” Fatwa says. “Even though I was talking to many people quickly, I remember this woman. I couldn’t get her name, but her face and her story are locked in my heart,” he says. The quake registered 7.5 magnitude. Then came the tsunami. Observers reported the wave was as much as 20 feet high. Some villages could not be reached for days. The death toll continued to climb. But for this young mother, there was only the immediate reality of sudden loss. Morning brought unwelcome news. No markets or banks open, cellular phone towers were down, food and water scarce, and roads impassable. 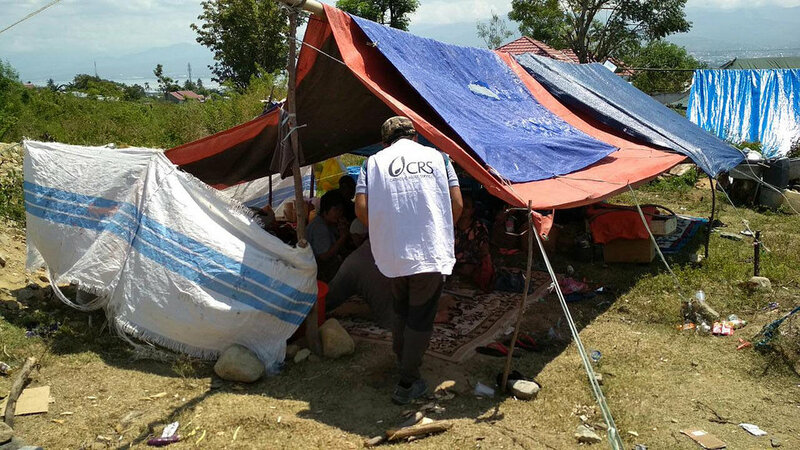 Caritas is preparing to provide food, clean water, medical treatment, emergency shelter, hygiene kits and other survival supplies. 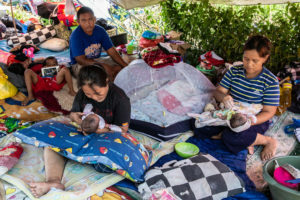 Please donate to our appeal so that we can provide supplies to people affected by the Indonesia earthquake. 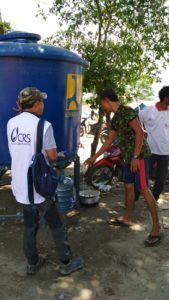 For CRS staff like Fatwa, who is working in the city of Palu, the hardest hit area of the Indonesian island of Sulawesi, the response is personal as well as professional. This is his home.